Cortney Andrews, Setup #2, 2017, C-print, 20 x 15". Like the Joan Didion book it’s named after, Cortney Andrews’s exhibition “Play It as It Lays” is a feat of emptiness, alert to the threats posed by fragile things. If Didion’s characters skirted the moral void of Hollywood—an inner blankness represented by white space on the page—the absence in this show is even more overt, manifested in hundreds of unfilled glasses that cover the gallery floor, an installation titled Play It as It Lays, 2017. Chalices and tumblers, flutes and grails—the shadows don’t play on the wall, they just loom. The work is darkened so that viewers are brought to the main gallery area via a dim corridor. The ambience feels paranormal, optimized for hexing. 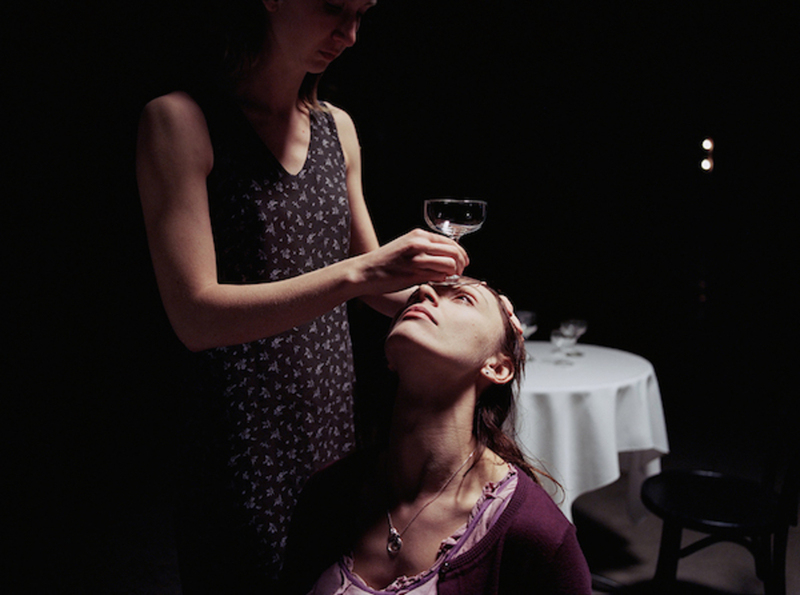 The centerpiece video, Play It as It Lays, 2015, is projected behind the installation and depicts an enigmatic parlor game where people balance glasses atop one anothers’ foreheads. Without music or dialogue, the footage ratchets anxiety through a crescendoing silence, though the occasional splash of glass and grit of shoes treading on the pieces lend further unease. The players’ movements—a zombified sway based on an allegiance to the empty cups that sit above the brain—suggest the absentmindedly sober decorum found throughout art spaces. For a long instant, the camera pans too close on a woman’s dress, and blackness eclipses the lens.